If you still plan and conduct your job searches the same way you did 10-15 years ago, you probably aren’t getting the traction you used to back then. Some things never change, while others seem to change every time you turn around. If you don’t see the need for significant change in your job search plans or if you actively resist the idea of making changes, it’s important to understand one key fact: Change will happen with or without you! Years ago, we used to scan the classified section of the Sunday newspaper for job openings in our target field. It was typically a very fat section and often included a hefty percentage of engineering and other technology jobs. These days, newspaper classified sections (if they still exist) are anemic by comparison. And you won’t see things like executive positions advertised there. The problem is, of course, that you’re not the only one who has noticed that trend over the years. Your competitors for those desirable job opportunities know it, too. Generate job leads–not primarily from print ads now but from offline as well as online sources; most important, you need to do it through personal contact. Network your way into target companies and possible opportunities–preferably before the openings become widely publicized. Build and maintain a robust network of professional contacts–yes, some of them can also be personal friends or acquaintances, but you need to cast a much wider net than that. In my book, there’s no such thing as an effective “lazy person’s job search.” You need to put some muscle into the activity if you expect to execute a successful job search–and I don’t just mean the muscle you use to click your computer mouse. Need to Use Social Media in Your Job Search? If by social media, we mean LinkedIn, Facebook, and Twitter, the answer is yes, maybe and it depends. I think it should go without saying that serious job seekers need to incorporate LinkedIn into their job search–and, in fact, their entire career management plan. Facebook might be useful if, for instance, you access company pages and can get an idea of what your target companies are up to. Twitter showed promise initially, but I’m not so sure it has held up over time, unless it has relevance for certain types of companies and jobs. Whatever choices you make about social media, the key is whether a given platform offers potential usefulness for your job search. For example, if you’re seeking a CFO position, how likely is it that you’ll garner employer interest through your participation in Pinterest? 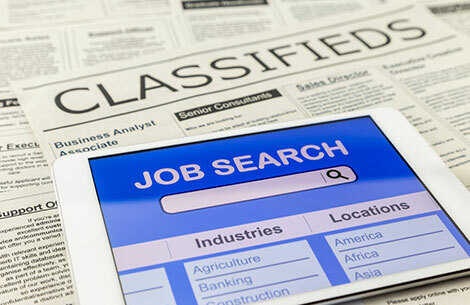 Blend the best of the “old” and the “new” in your job search. Choose your career tools wisely, keeping in mind your ultimate goal of landing that great new job–what’s most likely to help you get there? In other words, what will enable you to gain the competitive advantage you need in order to cap your job search with a “win”? Whether it’s low-tech, high-tech or a combination of the two (my preference), that’s where you want to focus.